Arby’s Grilled Chicken and Pecan Salad is a new menu item at Arby’s. Arby’s is known for their hearty roast beef sandwiches, but they do so much more than roast beef. They make a delicious nut and fruit filled grilled chicken salad like no one else. 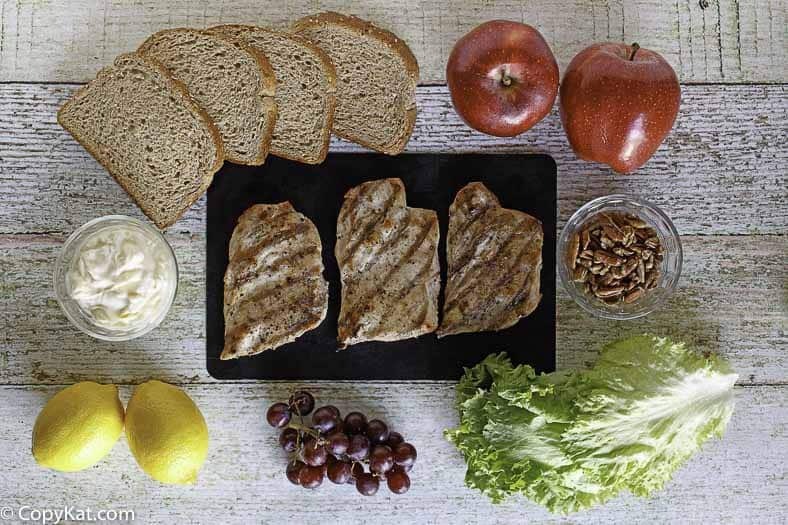 Many places skimp on the nuts when they go into a recipe, well, Arby’s knows how to make a chicken salad that is packed with all sorts of tasty ingredients. You can try one of their Market Fresh Grilled Chicken and Pecan Salad sandwiches at home. You don’t need to limit yourself to just a sandwich with this chicken salad; you could put this in a large tortilla for a wrap. This chicken salad would go well in a submarine bun; I loved this with toasted sourdough bread. Honestly, this goes well only scooped out and placed on a salad. If you don’t happen to have any grilled chicken around, you could use leftover chicken that you may have from a baked chicken. If you need to grill your chicken, I will grill up about 1 to 1 1/4 pounds for this recipe. 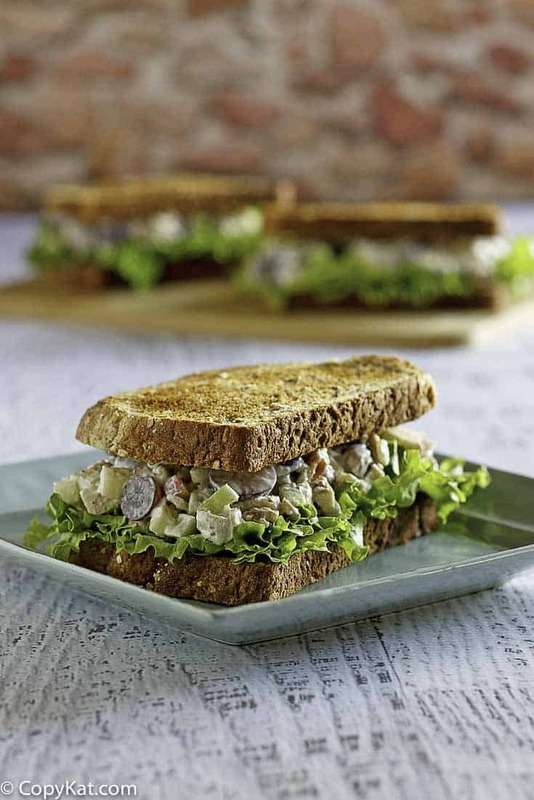 This recipe is very flexible, you could add a little more or a little less of any of these ingredients, and you will come up with a great tasting chicken salad sandwich. While they do not toast their pecans, I think you could easily bring this salad to the next level by toasting the pecans in a skillet over medium-high heat just until they become fragrant. Allow the pecans to cool completely before preparing the chicken salad. Do you love Arby’s? Be sure to check out these other copycat recipes. Arby's Grilled Chicken and Pecan Salad is a delicious chicken salad. Arby's does not always offer this recipe online. In a medium-sized bowl add diced apple and one tablespoon of lemon juice. Stir lemon juice into apples coating them well. This will help keep the apples from turning brown. Add chicken, sliced grapes, diced celery, and pecans. Mix well until everything is mixed through. Add 1/2 cup mayonnaise, if the mixture is too dry you can add another 1/4 cup of mayonnaise. Add salt and pepper to taste. Allow flavors to marry in a covered bowl in the refrigerator for about 1 hour before serving. o prepare sandwich like Arby's use thickly sliced wheat bread, add a couple of slices of green leaf lettuce, and add about 1 cup of chicken salad to the sandwich. While they do not toast their pecans, I think you could easily bring this salad to the next level by toasting the pecans in a skillet on medium-high heat just until they become fragrant. Allow the pecans to cool completely before preparing the chicken salad. I really enjoyed this chicken salad. I love how your imitations are low sodium and low fat. I have high blood pressure and I am on a strict diet. I have been making this salad sandwich for years even before I had it at an Arby’s. Then I was disappointed that Arby’s discontinued the sandwich. I can make a batch and buy a whole grain bread, if I have guests that can eat bread freely and still feel we are all sharing a lovely lunch together. I have been eating a low carb for my digestive disease and I just use lettuce wraps (and a fork and knife unless I’m home by myself. 😉 I have experimented with different dried seasonings when I marinate it for the hours (usually I find that 4 hours allows the flavors to incorporate together. Everything from powdered ginger and garlic powder to dill and curry (not all at the same time) but to change it up. I have also used used sugar or Truvia (a sugar substitute) to candy the pecans prior to adding them in the salad. (I do crush the pecans a little in bite sized pieces especially if I candy them. This recipe is really flexible and I find just as good in the spring time as in the fall. I may try (half pears and half apples) or plumped craisens. Just so versatile. Also I wanted to add that some very high quality all white chicken meat packed in water rather than oil and drained before adding…(like the kind you get at Costco) can be great in a pinch if you don’t have leftover chicken. How long will this keep in h fridge? I would keep this about 3 or 4 days in the fridge, and not any longer. Have you tried freezing this, and if so, does it freeze and thaw well? I have not tried freezing this recipe. Maybe another person could share that info. Hi there and thank you for doing this site, it is greatly appreciated. I am curious if you may know how to make the BBQ sauce from McDonald’s by any chance please? It is my absolutely my favorite and some of them get pretty stingy with handing it out lol. Thank you again. I don’t happen to have this recipe. I agree they are stingy with the number of sauces they hand out. Chick Fil A will give you all of the sauce you need. yesterday my neighbor and I went to the Arbys in Waukee for their chicken salad with grapes, apples, pecans, etc, and was told they no longer carry it. We left. we were looking forward to the salad and nothing could take it’s place. Sorry, Arby’s. They discontinued the chicken pecan sandwich last year. Hello, this sounds so.good that im making it today but my question, I forgot to get lemons, do I.have to add the lemon juice and is it ok to add dry dill from my seasonings instead of fresh dill? You don’t have to add the lemons but they will keep the apples looking fresh. You are free to add dill if you desire. I use this method with ALL my apple recipes!!! Hope it helps YOU, TOO! Thank you for that suggestion, I will have to give it a try. I worked for Arby’s and we used to soak the apples in Sprite or Sierra Mist. Pretty sure there is some kind of spice in Arby’s Chicken Salad recipe. Could be Thyme, Tarragon or Parsley. does anyone know for sure. Maybe an Arby’s Employee? This is an Awesome Chicken Salad Recipe. Love it with Walnuts and diced Granny Smith Apples. I will have to go back and try it again, I didn’t detect any herbs or spices. Thank you for your suggestion. I worked at an Arbys for several years as a line cook. Your recipe is close. However we used Sierra mist syrup from the soda machine as a sweetener for the apples, so maybe a soak the apples in some water with sugar and lemon to replicate that flavor. Helps to keep them from browning as well. Reduce the sugar for sweeter apples. As far as spices, I believe the chicken came packed in a blend that contained some rotisserie seasoning, including tarragon. Smelled lovely when it was being roasted. As a former employee, I still eat there often. They do make quality stuff still, and it’s made with a lot more care than other places. Do you leave the skin on the apples? Thanks! I love Arby’s Chicken salad and this tastes just like it. I simmered my chicken breasts in plain water and they tasted just fine in this recipe. I think chicken breast just simmered in plain water tastes amazing already. Your instructions in the recipe are repeated, you should probably fix that. And the part about roasting the the pecans is repeated after the recipe. Can you make anything from Raffertys restaurant like their potato soup ???? I would need to try it before I can say, and I don’t know where one is located near me. This is awesome! Arby’s no longer has this sandwich anymore. So now I can still enjoy it. It used to be called the Market Fresh chicken salad sandwich. There are dried cranberries in salad also. Thank you so much for this recipe!! I love Arby’s salad but HATE my neighborhood Arby’s! This way I can have it MINUS the attitude! Tasted EXACTLY like their’s! I didn’t add the apples or celery but didn’t miss it at all. Imho, the pecans and the grapes make it perfect! I haven’t been to an Arby’s in years. I had no idea they made things like this! Thanks for this recipe! I don’t eat chicken so I slice tempeh thinly and marinate with soy sauce, microwave, then let cool. So. Good. And I add a bit of dill.